Stepping out of Christmas for a second and into the realm of Little Golden Books, and what might have been my favorite of the genre when I was wee. This story is the primary reason I knew was a platypus was growing up, and the absolute main reason I wound up a mountain in a rain storm to see one in the wild when my husband and I traveled to Australia. As we stood in the mist and the fog on a little wooded trail and watched the tiny creature bubble up to the top of a pond, I couldn't help but remember this book and its ice cream eating oviparous mammal. So the story goes, that a rabbit finds an egg, but can't for the life of him figure out what sort of creature hatched out of it. When they arrived, the egg had hatched. There stood the strangest animal that ever was! "He doesn't look like any animal I have ever seen before", said Rabbit. "He has a big beak and little webbed feet just like Duck." "He has a tail and a fur coat just like Beaver," said Mrs. Hen. "And he is very shy, like Squirrel." "What are you, my dear?" asked Mrs. Hen. But the roly-poly animal said, "I don't know." Then splash, kersplash! that roly-poly animal jumped into the river and swam right down to the bottom. Needless to say, the rest of the book is spent trying to figure out just what in the blazes the thing is, and as is always the case in misadventures like these, it takes wise circus folk to figure it out. I can't recommend this book enough based on shear cuteness alone. 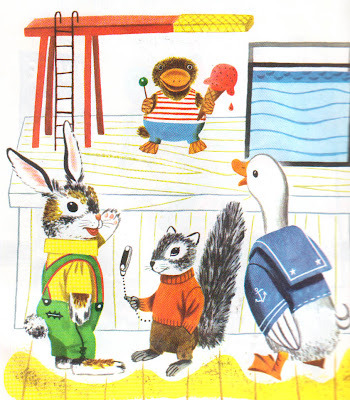 Really, anything Richard Scarry breathed on is gold as far as I'm concerned, but Rabbit and His Friends in particular stands apart from the rest. 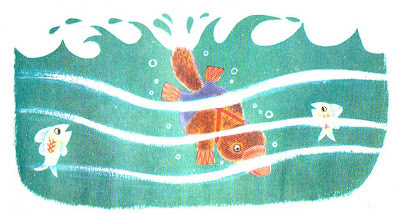 Check out scans of the whole book at this amazing blog called Golden Gems that highlights Little Golden Books and more. Awesome! I LOVE this book, and it is currently on my children's book shelf awaiting their love. This is a great site - thanks for the trip down book memory lane! Loved this book too - great choice! Love the fact that it inspired an experience down under too! you know, australian animal experiences and kids' books go hand and hand! Ahhh...thank you so much for this post. I could not for the life of me remember the title and wanted to find the book again. Thanks! My gal bought this for me the other day, and it is adorable. Some of the cutest illustrations ever! Think my favorite is the duck. 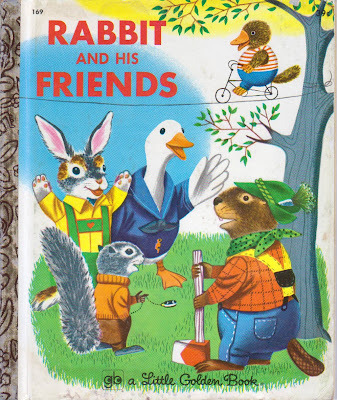 But really...it shouldn't be called "Rabbit & His Friends" -- how about "The Platypus Story" or "Forest Friends" or such? "Rabbit and His Friends" is a gentle, sweet little book indelibly etched into my memory as a tale of how everyone has a place in this world, and everyone has value. The shy little platypus in his 1920s swimsuit with the lollipop in one webbed forefoot and the ice cream cone in the other is adorable.